The Deep Silence 5 is what Nanoxia calls a “Big Tower” case. By my ruler, it is 550 mm tall; counting the back thumbscrews it is 560 mm long; and it is 235 mm wide (21-3/4 by 22 by 9-1/8 inches). The DS5 has 10 expansion slots. It has lots of room for equipment inside. It comes in three classic colors — White, Anthracite and Dark Black. Today’s specimen is Dark Black. Nanoxia released the Deep Silence 4, 5 and 6 together. Previously we reviewed the DS1, the DS2, the DS4 and the DS6. Today we review the fifth of the series, the Deep Silence 5. By now, it is clear that the Deep Silence line of cases share sleek looks and internal acoustic padding designed to produce “almost noiseless” cases. The huge tower features a more than generous space as well as fully modular HDD cages. 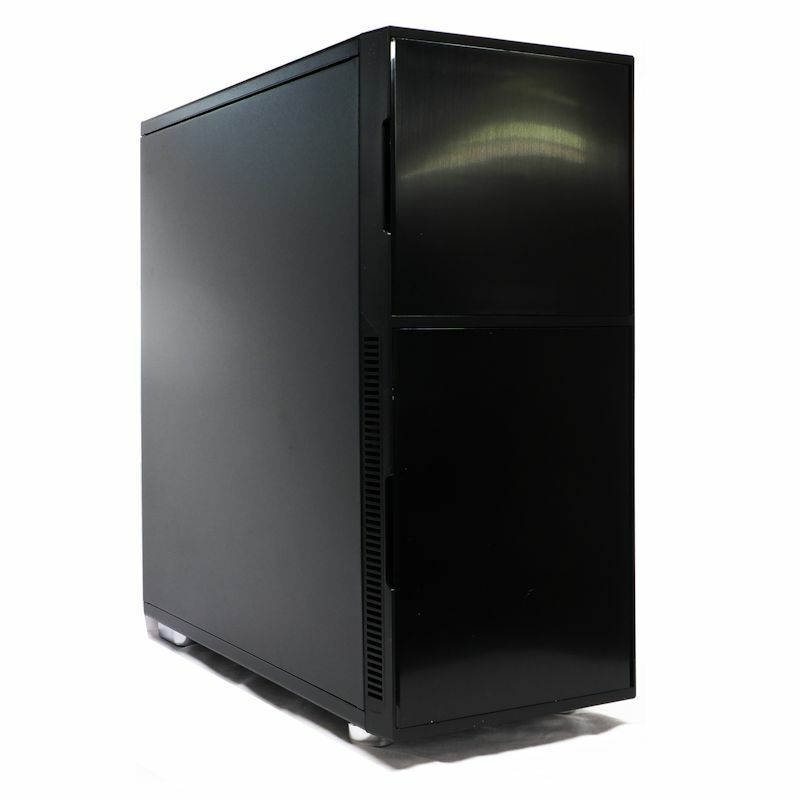 Thus, the most extensive gaming systems can be installed in the case, with extra-long graphics cards and high-end CPU coolers. Alternatively, compact water cooling systems can be accommodated without encountering any space problems in the Big Tower. The Deep Silence 5 comes with two foam insulated front doors. 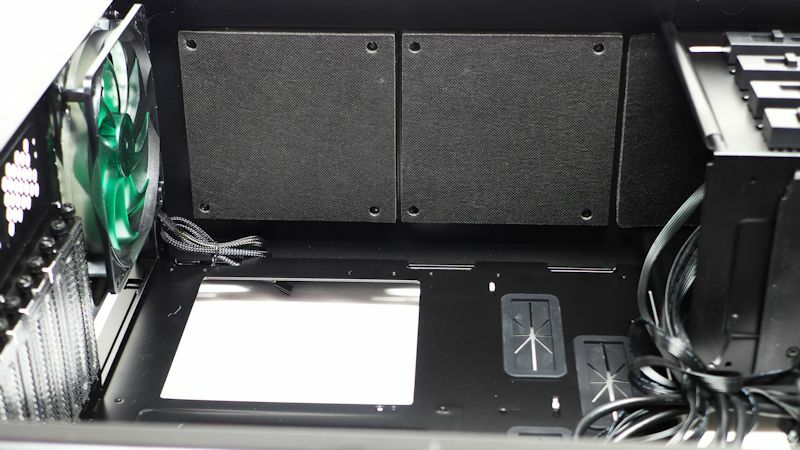 Behind the upper door the Deep Silence 5 offers four external 5.25 inch bays, a stepless 2-channel fan controller, as well as the reset button. 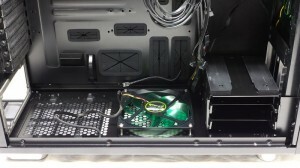 Behind the second door two silent 140 mm Nanoxia fans are preinstalled in practical “Easy Access” fan trays. 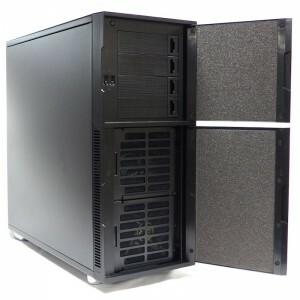 As with all Deep Silence cases magnets in the doors provide fast closing and easy opening. You can install E-ATX or XL-ATX motherboards in the Deep Silence 5, as well as smaller form factors (ATX, M-ATX, Mini-ITX). Thanks to the generous interior space the Deep Silence 5 can be equipped with CPU cooler with a maximum height of 185 mm and graphic cards with a maximum length of 338 mm when all HDD cages are used. By removing the top two hard disk drive cages, even VGA cards with fabulous 468 mm in length can be accommodated. 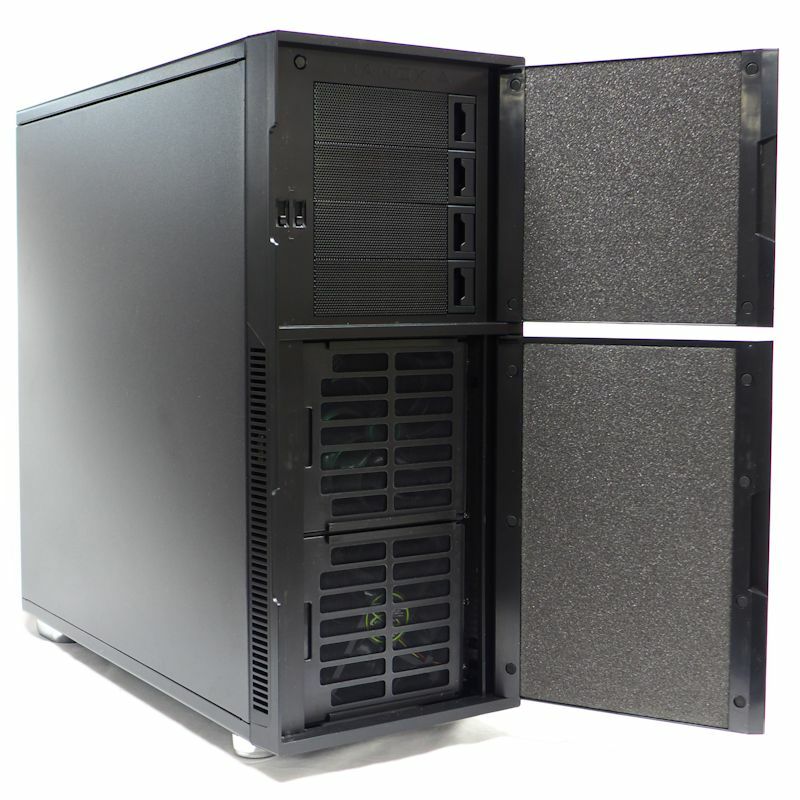 As all Deep Silence cases, the Deep Silence 5 is fully soundproofed. 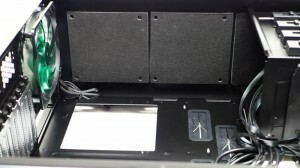 The whole case is lined with noise absorbing materials. The sound insulation concept is designed to minimize and eventually resulting noises from the hardware. 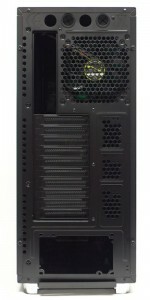 Hard disk drives and the power supply are mounted decoupled and the tower rests on anti-vibration case feet. Nanoxia goes on to describe additional features in some detail. You can read more about them here. They also include a world-class user’s manual, which they publish online here. It tells you everything you want to know, and then some. You have seen the front of the case. We’ll return to it in a bit. But now let us look at the side walls. Flat and black. 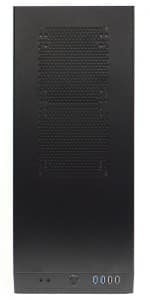 On the back, you can see the thumbscrews that add 1 cm to the length of the case. At the front, the matching vents that allow air to get to the intake fans while blocking the noise. We’ll take a closer look later. 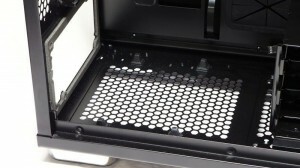 Viewing the back of the DS5 shows us grommets in two of the holes provided for external water cooling equipment. The other two grommets fell into the case during shipping. Next, we see the 140 mm exhaust fan. Finding a 140 mm exhaust fan is a good sign: you definitely can put an over sized heatsink like the Silver Arrow inside. Then there are ten expansion slots. This will give your GPUs room to breathe. Finally, a bottom mounting space for your PSU. A bottom view shows the DS5 without its rails. But you get a nice view of the filter. An overhead view reveals that the top has mounting holes for 120 mm and 140 mm fans, as well as the proper holes for 240 mm (2×120) and 280 mm (2×140) radiators. Nanoxia should be commended for the built-in flexibility shown here. Straight from the factory, the grills are blocked by purpose-build plastic panels. We will look at the other side later. At the front we can see the top-mounted I/O cluster. 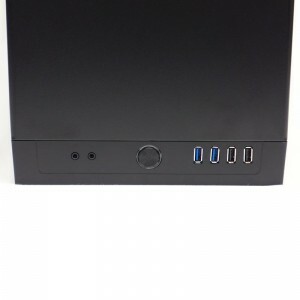 It has a complete set of basic I/O: headphone and microphone jacks, the power button surrounded by a power LED, two USB3 ports for high speed connections, and two USB2 ports for handy items like wireless mice and keyboards – items that do not need a high data throughput but need a place to settle. One small thing: Nanoxia did not choose to hide the power button the way they hid the reset button. That is unfortunate, because it is too easy to hit where it is, and you can inadvertently turn it off. Since I have done this myself, I know it is not an academic concern. Coming around to the front again, we can see the two padded doors that shield the 5.25” bay and the 140 mm intake fans. Those front fans actually quietly click, which you can hear if you get up close. But quiet clicking is exactly the kind of sound that is muffled by acoustic foam, so you can’t hear anything but air when you shut the doors. The fans swing out on pivoting frames. They are held in by clips, so you can remove them easily to use them elsewhere. On the front of the fan frames we have slide-out dust filters made from the same mesh as the bottom filter. You could vacuum the filters in place, or remove them and brush or wash them off. Speaking of filters, the second picture shows a closeup view of the front 5.25” slot covers. Not only are these easy to remove, but they are filters in their own right. Hold that thought for a moment while we look at the other features in this closeup. Those sliders on the left are fan controllers. In this particular case they are connected to the B and A sockets inside. But they worked identically. The reset button is also behind this door. This looks way too easy, so I tried something cute. I took out one of the intake fans. It was easy. Not only that, I discovered a little passageway for the fan’s power cable, that keeps the cable out of the way for pivoting the fan away from the hard drive cage. You would be surprised at how many case-makers forget little features like this. It is a nice detail to see. I put the intake fan inside the 5.25” bay, right on top of an optical drive – the slot covers popped out easily, as I guessed. The device supports held the 140 mm fan between them, and you can see there was definitely room for it. And one of the slot covers shows that they can act as filters. So if you want to leave the top door open you can have an extra 140 mm intake fan. The manual tells you how to remove the front panel on page 12. Basically, it says just to grab it on the bottom and give it a “firm tug.” When I did that, the panel bent, but it did not come free. I was afraid of breaking the front panel, so I looked behind it to find where lugs poked through. I pushed those through the frame, and then lifted it free. After that, it has been much easier to pull the faceplate off with a “firm tug.” Just a warning. Once you have gotten the front panel free, you can see nothing there you did not expect to see. In fact, with the two front doors, there is no need to remove the front panel. In the 5.25” bay we have a cradle for a 3.5” device. 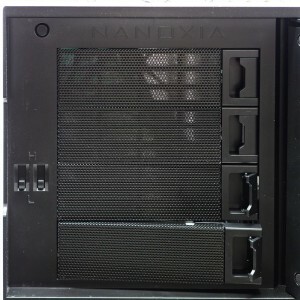 Nanoxia refers to it as “the external 3.5 inch bay.” It has a dedicated faceplate that we shall find among the accessories. Time to open it up. 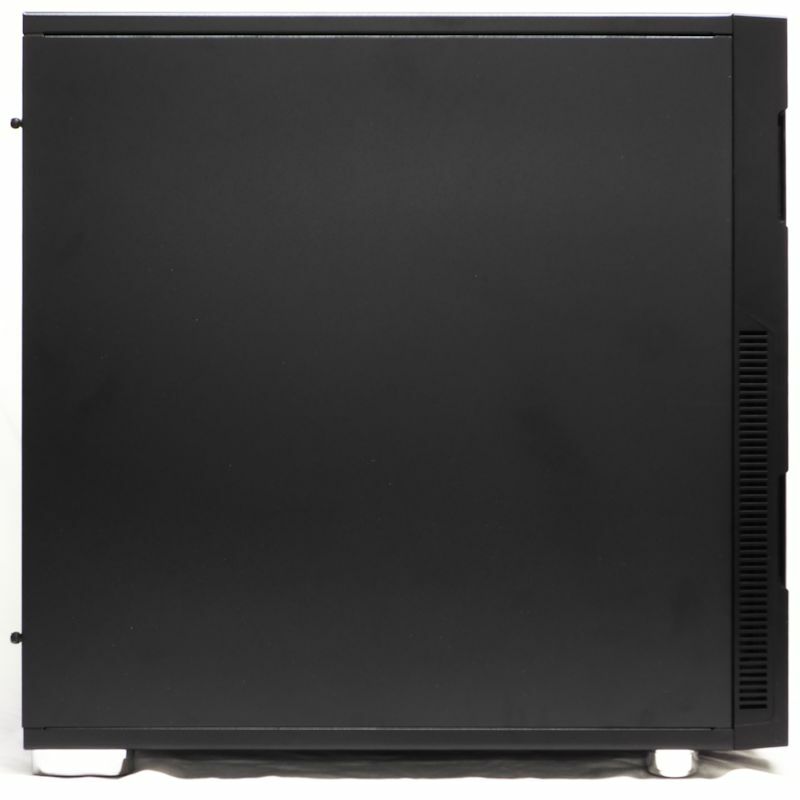 To open a Deep Silence 5 side panel, you unfasten a pair of thumbscrews and swing the panel away from the case. Each panel has a full-edge open hinge to allow the maneuver. 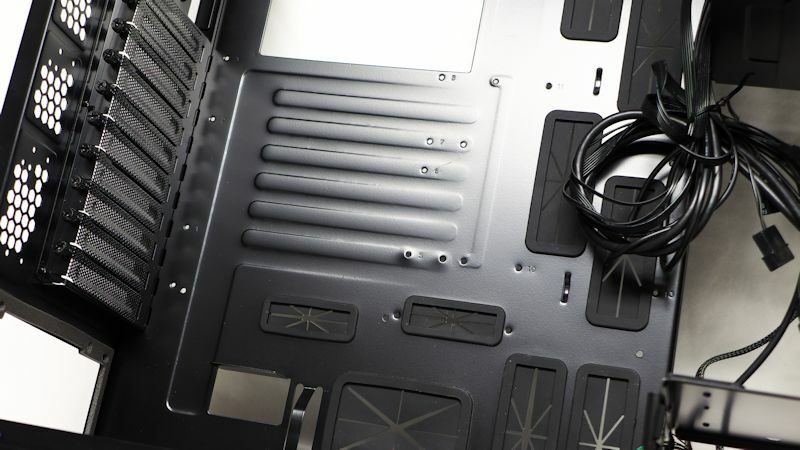 Note the left side panel has a quilted foam overlay to absorb fan sounds in the motherboard cavity, while the right side panel shows the bitumen layer –hidden by the foam on the left – that absorbs the lower-pitched vibrations and keeps the case from sounding like a drum. These are heavy panels – when I stepped on my scale with each of them I was five pounds heavier. So when you want to move the case it is easier if you remove the side panels first: with the side panels removed, the case is down to 26 lbs. We will get closer looks later, but an overview shot of the open left side of the DS5 first reveals the 140 mm exhaust fan. Across the top are the fan hole covers, mostly hidden. In the upper right are four 5.25” bay slots. As we saw earlier, the bat is open at the top, which allows you space to play. Maybe a reservoir would fit there. Below that are eight of the eleven 3.5” HD sleds. They fit in three cages, which fit in a fixed order. The top two HD cages are removable by lifting tabs. The bottom cage is held in by screws. In the bottom center is another three-drive cage. This one is interesting because it is fixed to a plastic base. There are screws you can take off to make the HD cage removable. The base, of course, is held be screws. 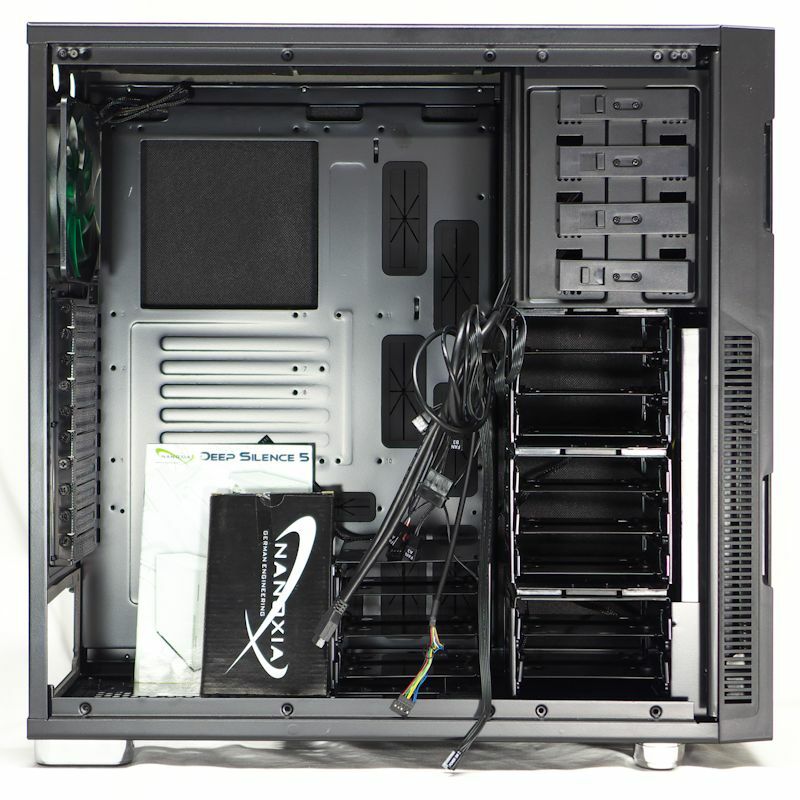 Finally, in the bottom left we see the PSU space, temporarily occupied by the case manual and the accessory box. 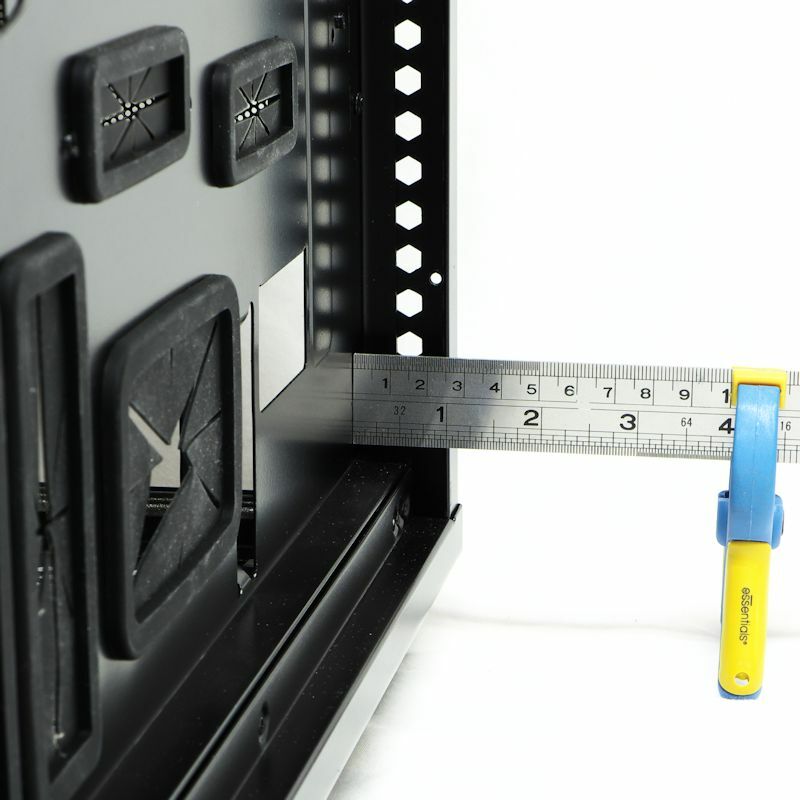 Behind the motherboard tray, we see that there are tool-free 5.25” clasps on both sides of the bay. The three top pass-throughs have a decent size, and the edges are rolled to prevent finger cuts. The CPU window looks to be fairly tall. 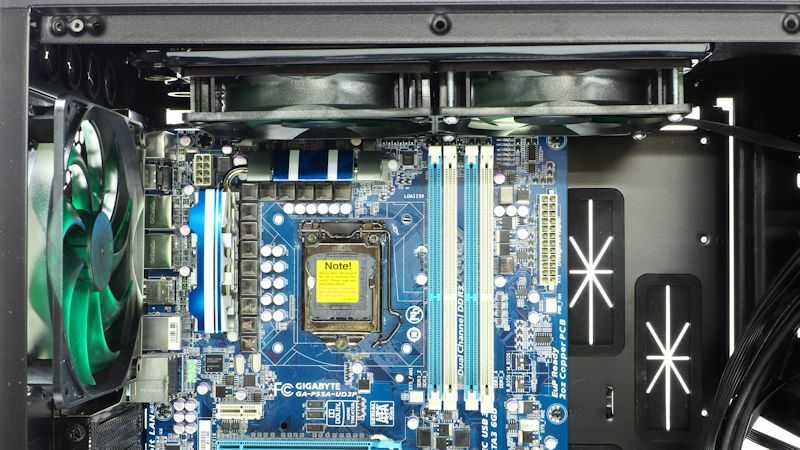 The center and right areas of the motherboard tray seem to be devoid of tie-down spots, but there are nine grommeted pass-throughs. 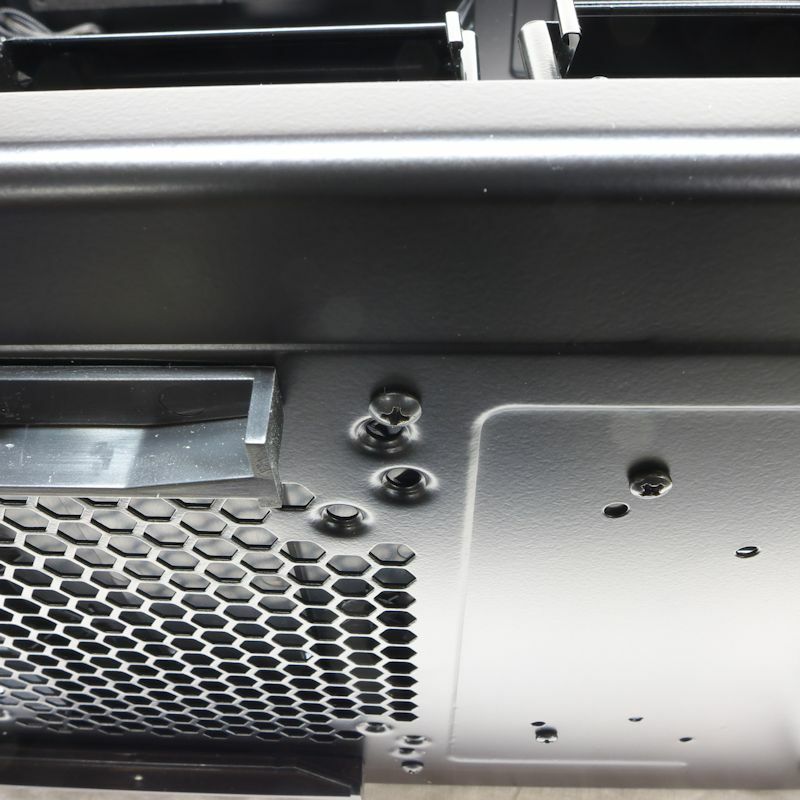 We can see the lift-up tabs that allow you to remove one or both of the upper two HD cages; but you must remove them in order as you cannot remove the lower cage and leave the upper one hanging. The fan wire shows where one of the intake fans is hiding. Finally, there are four silver-colored fans screws perched on the sill. That sill is where the side panel rests while you are closing it. In the left picture we have the top two HD cages removed. Now the front intake fans are free to blow air into the case. 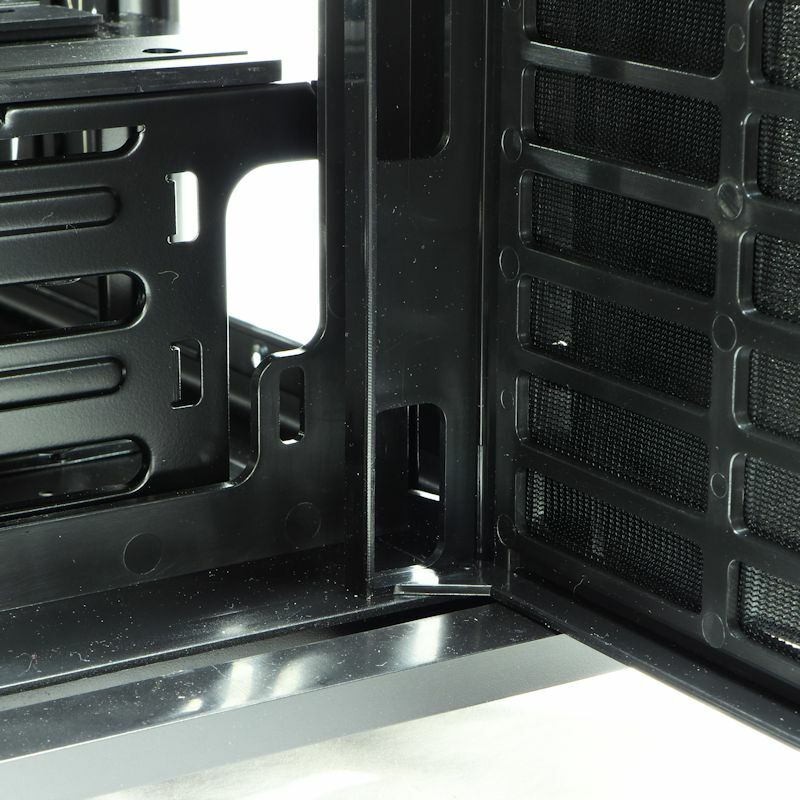 The mid-case HD cage and its pedestal mount can be removed, which the right image shows. How does one remove said pedestal? In the left picture the screws on the left fasten the pedestal to the case. 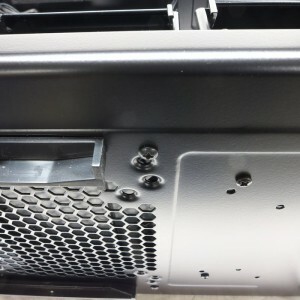 The screws to the right in that picture hold the bottom HD cage in the hard drive stack. Removing that allows you to mount a rad in front (more on that later). 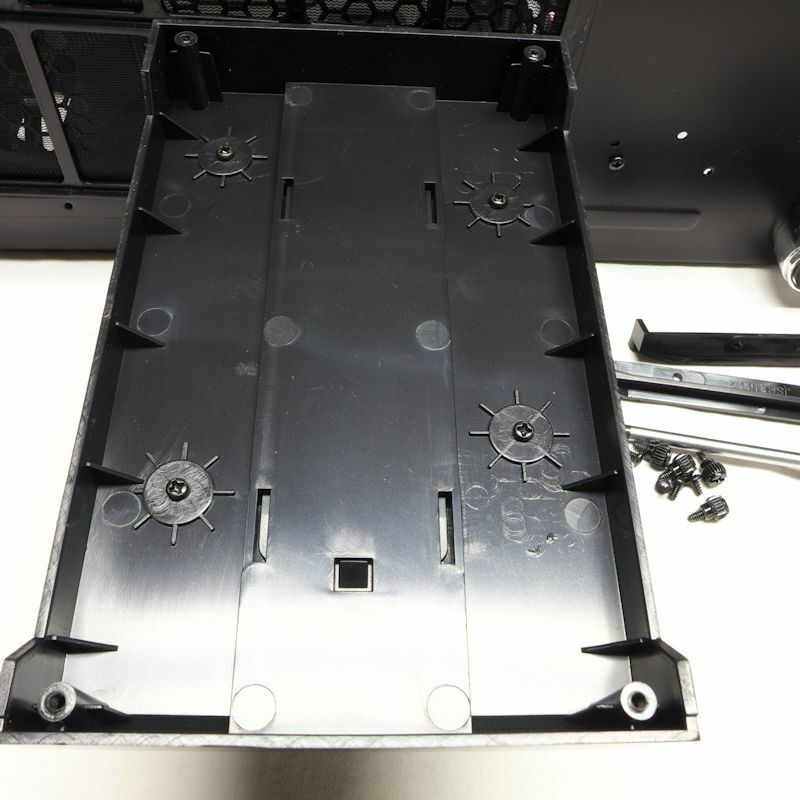 When the pedestal is removed, the underside shows yet more screws that hold the HD cage down. Unscrew those, and at last the mid-case HD cage can be freed by lifting its tab. I’m thinking that this is a LOT of screws. Those Nanoxia engineers really went wild. Returning to the main motherboard chamber. First look at the PSU padding. This is standard on the newer Nanoxia case. The PSU itself will stand on those rubber bumpers. 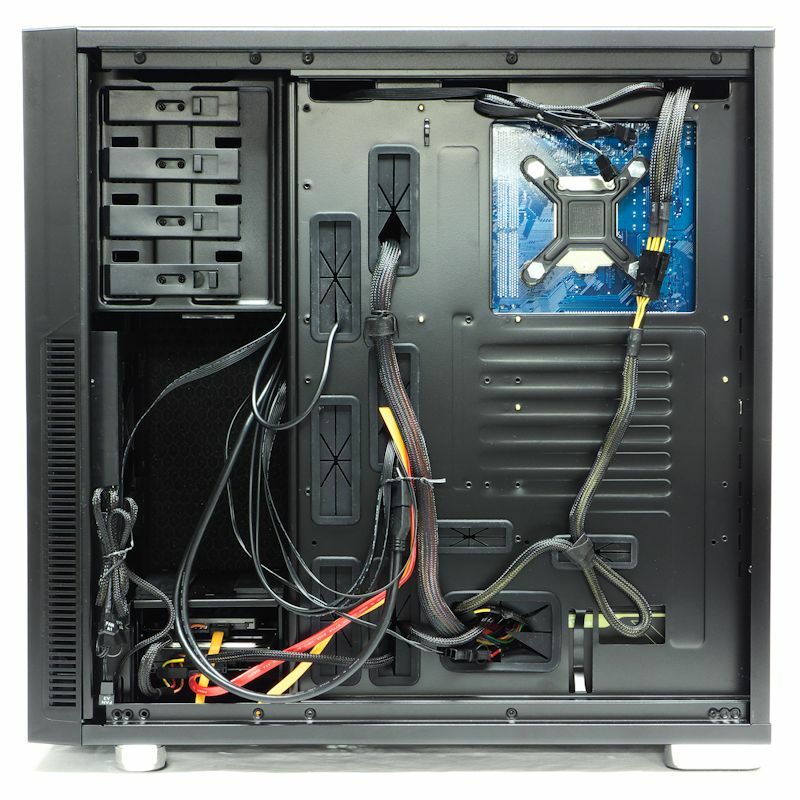 Finally, even with the center HD cage in place there is room for a long PSU. The second picture shows what you can do with the center HD cage removed. That is a 140 mm fan there, with screws properly sited in 140 mm square fan screw holes. There are also screw holes for 120 mm fans, so you can use a 120 mm fan or a 140 mm round fan. Now we have the obligatory case wire glamor shot. Why we have an AC’97 sound plug, I don’t know. The rest of the wiring is all there: a HD plug, a duplex USB3 plug, reset plug, sockets for the B fan control slider, a duplex USB2 plug, a Molex power socket for the front fan controls, sockets for the A slider, etc. Moving up, we see the motherboard standoff positions all stamped and numbered. Refer to your manual for exact instructions. 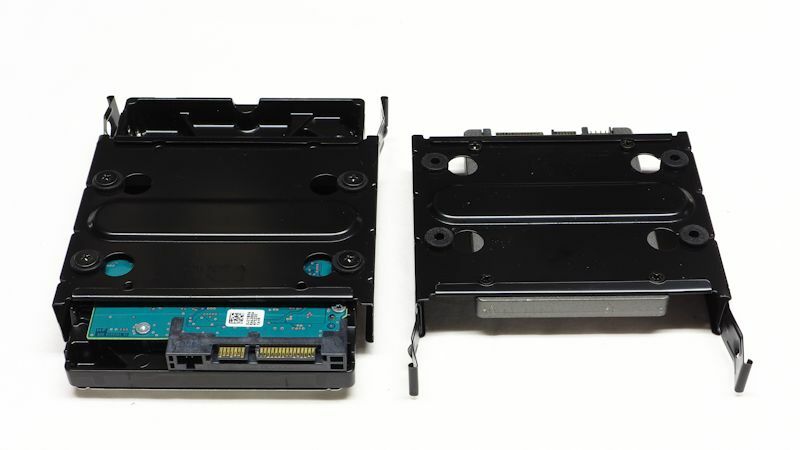 The expansion slot covers are held in by thumbscrews, in a place where it is hard to use your fingers. I highly recommend that when you put an expansion card in one of those slots, use screws and a screwdriver. It’s much easier. Further up the motherboard cavity we find padded tiles screwed to the ceiling. To the right is a piece of acoustic padding that has been glued on. All in all, Nanoxia clearly takes the task of muffling this case’s contents very seriously. Unscrew the fasteners, and the two top tiles reveal themselves to be plastic plates bottomed with acoustic padding. 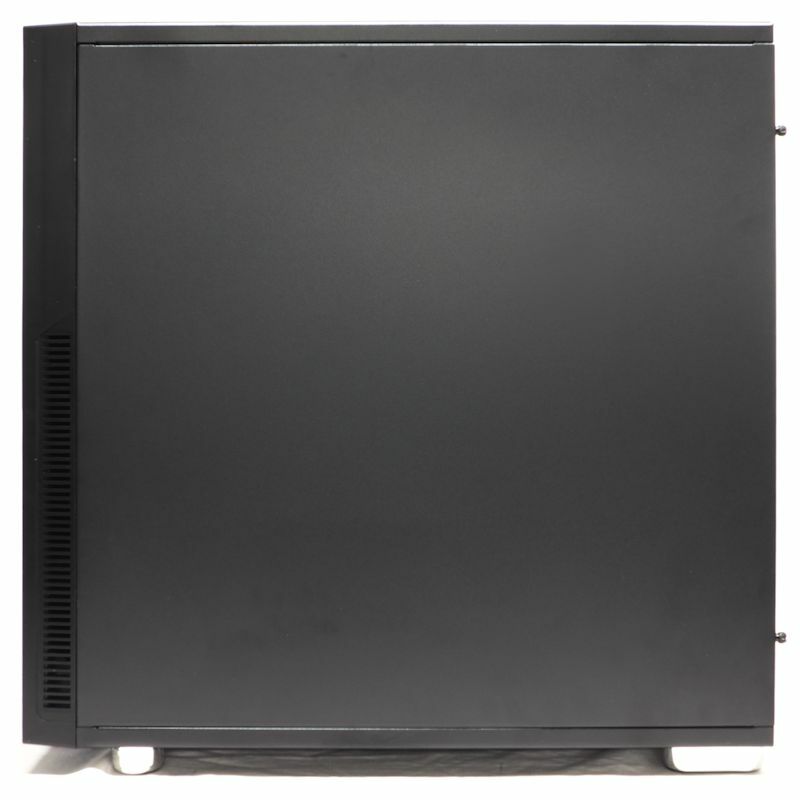 Perhaps you cannot see, but there are two positions each for the 120 mm and 140 mm fans: a close together position for 240 mm and 280 mm rads, and further apart positions that are centered in each grill for air cooling. 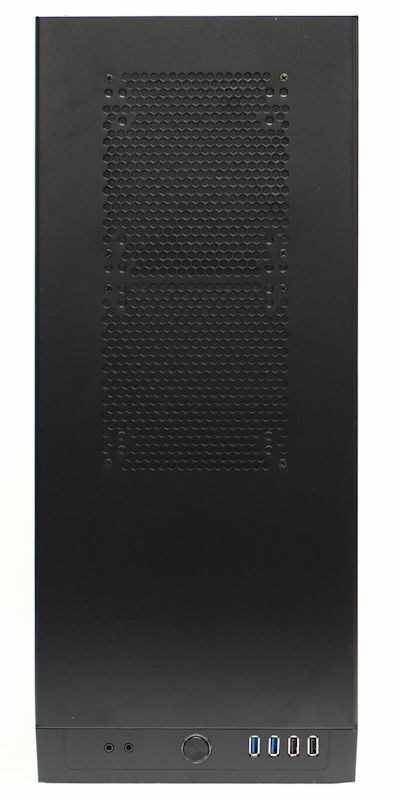 The drive sleds that fit into the HD cages have grommets for spinning-disk 3.5” hard drives. Nanoxia supplies special screws that have built-in stops to assure they are not over-tightened. 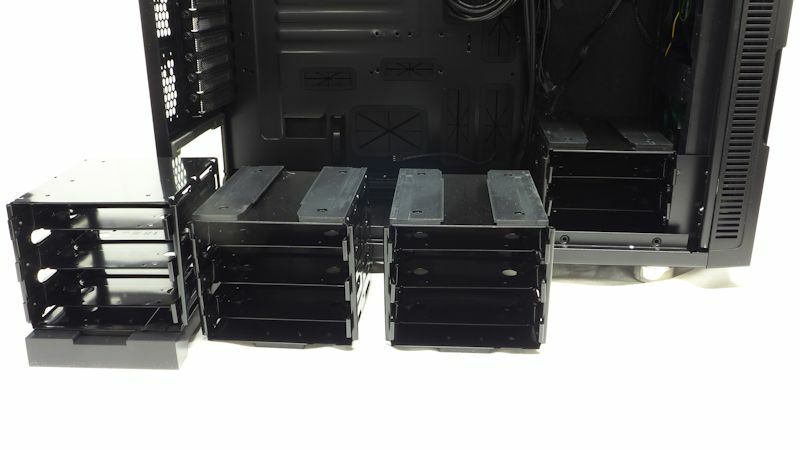 They expect your 2.5” drives to be SSD’s, so it is OK for them to be screwed directly onto the sleds. 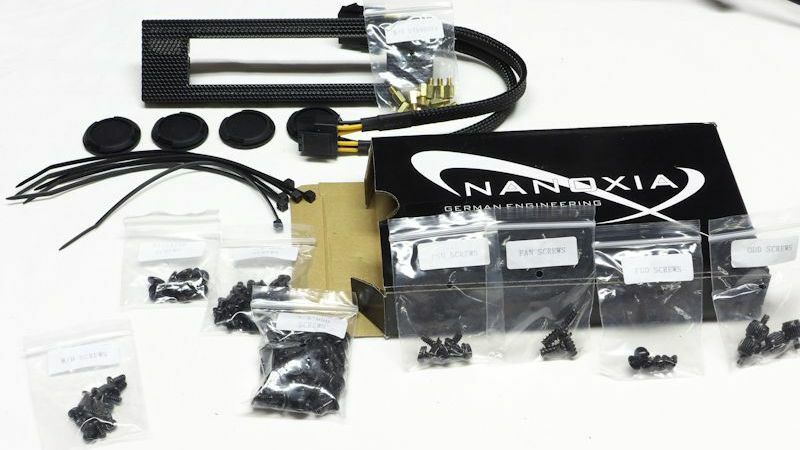 The Nanoxia accessories box contains six 150 mm zip ties, four rubber hole plugs to replace the grommets in the back of the case, a cover for the 3.5” adapter that goes in one of your 5.25” slots, a duplex 2×2 plug extension for your EPS, and carefully-labeled bags of motherboard standoffs and screws to mount your stuff in the case. Plenty of hardware for the discerning geek. Let us first scout out the motherboard cavity to see how much room there is. I put in standoffs all around the perimeter and measured the expanse they outlined. 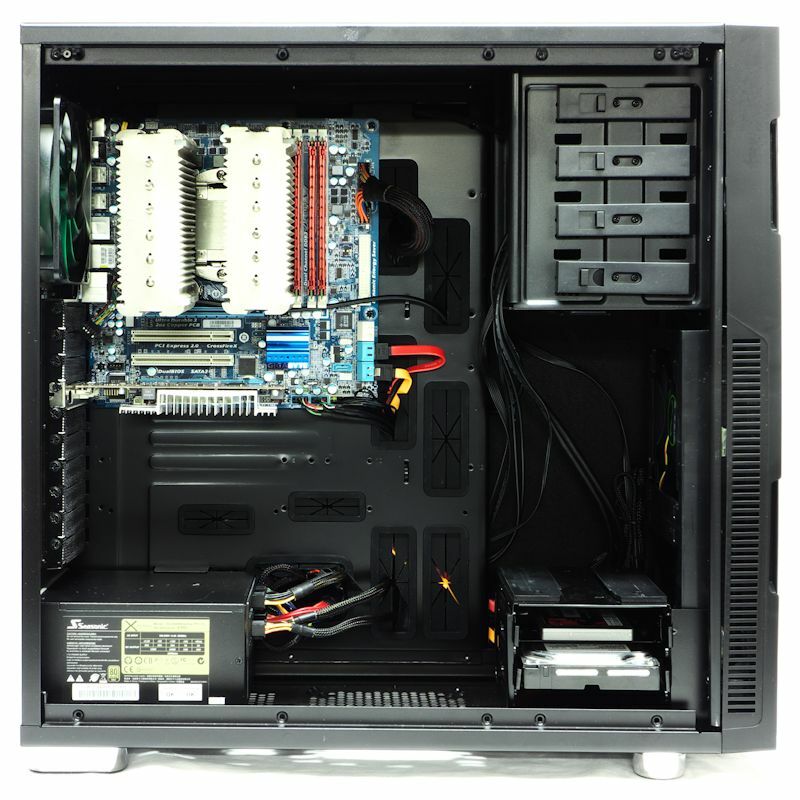 There was room for a 330 x 330 mm motherboard. So I put a standard ATX motherboard in there. 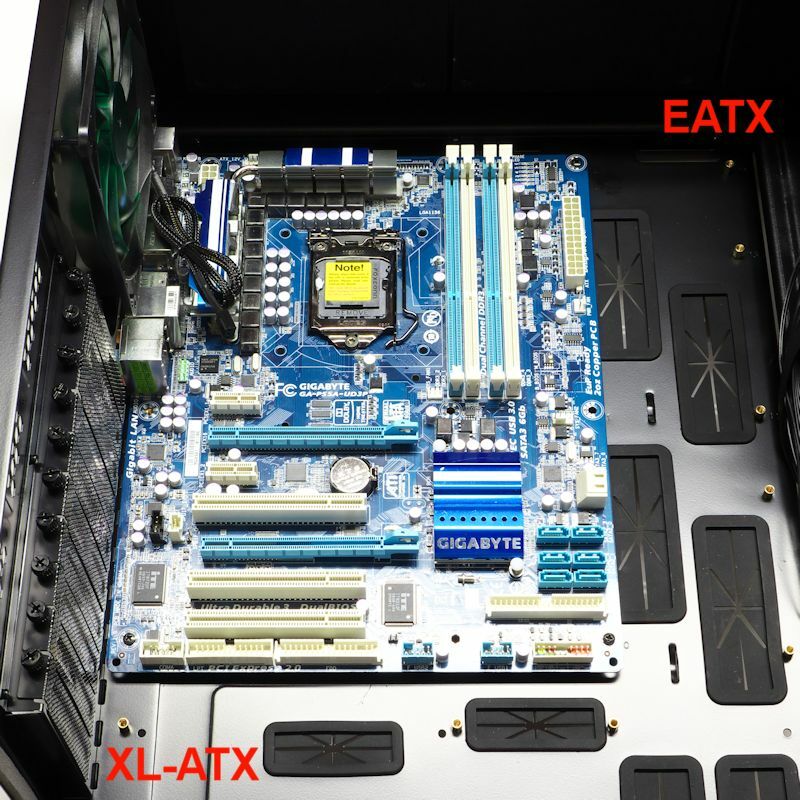 An EATX motherboard is as tall as an ATX, but extends to the right. As you can see, there is room for one of those. 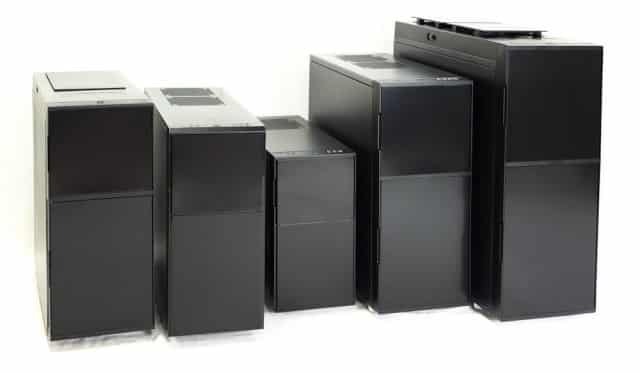 An XL-ATX has the standard width, but is taller. As you can see, there is room for one of those, too. This is a generous space. Behind the motherboard there is nearly an inch (2.5 cm) of space for cables. This, too, is fairly generous. I built a system twice, and put in motherboards three times. What an easy job. 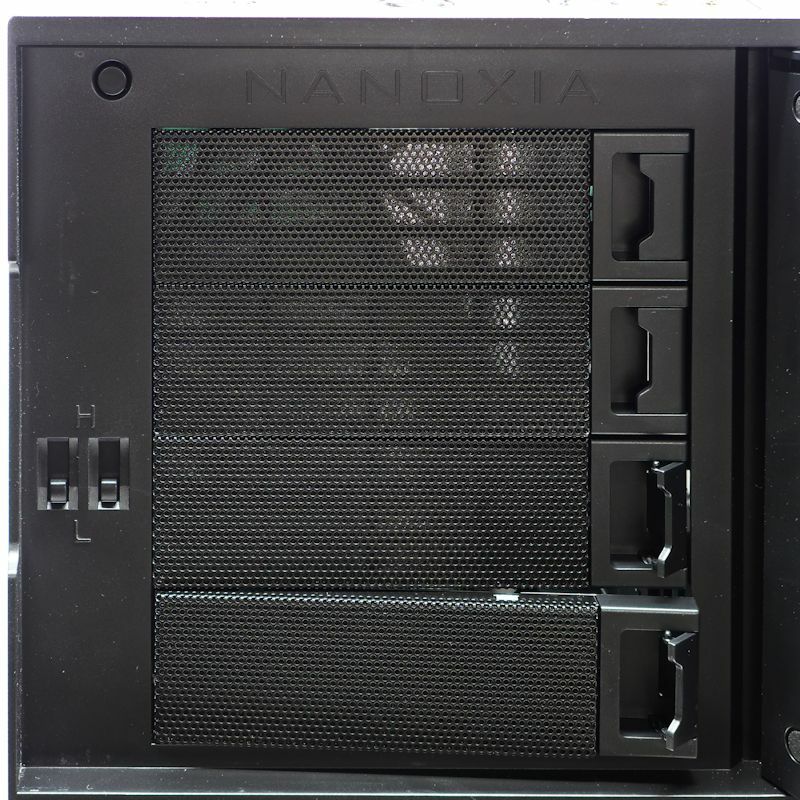 In a previous Nanoxia case, I could not get the 2×4 CPU plug through the space provided in the case. I was forced to use the EPS extension that Nanoxia provided. This time I scouted out the pass-through and found it plenty big enough to pass the CPU plug right through. 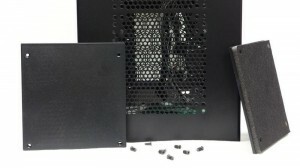 How ironic that the case was just tall enough that the reach from the PSU was just barely short of a comfortable fit. So I ended up using the extension again, this time as an extension cable. Below is the mATX system that tested the DS5’s cooling prowess. The spinning disk HD was right in the middle of the lower intake fan’s airstream for optimal cooling. Overall, the whole chamber has a clean look. That NH-D14 had plenty of room when the panel went on. 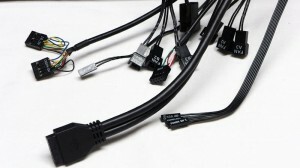 On the back, the excess lengths of cable showed up. 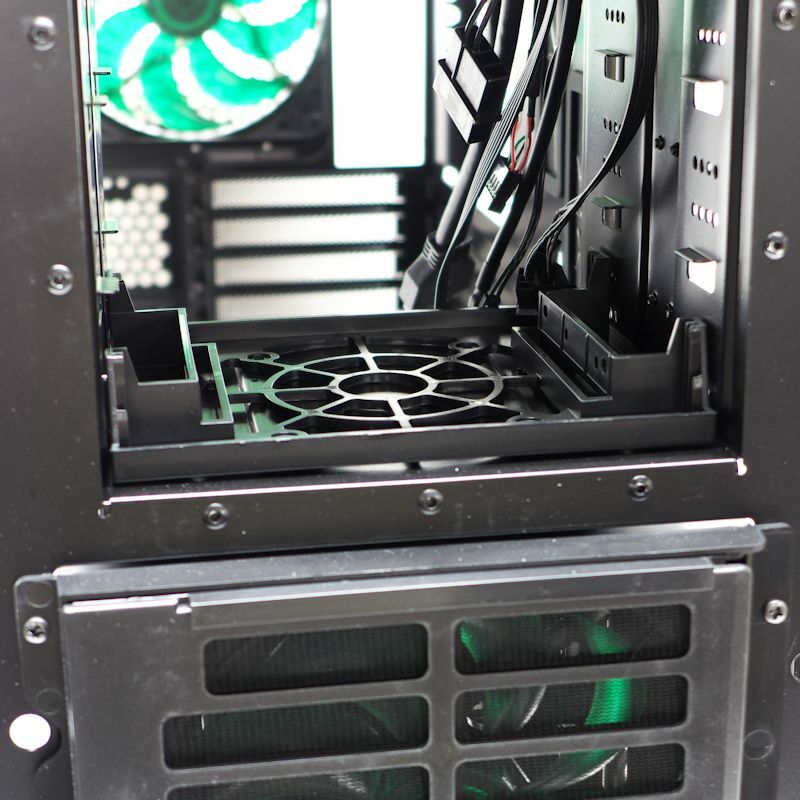 You can also see the CPU window, with the CPU heatsink’s backplate nicely centered in it. I was only able to make use of two of the tie-down loops. The case would have benefited from more of them, but there was enough room to do the job. Time to button it up. 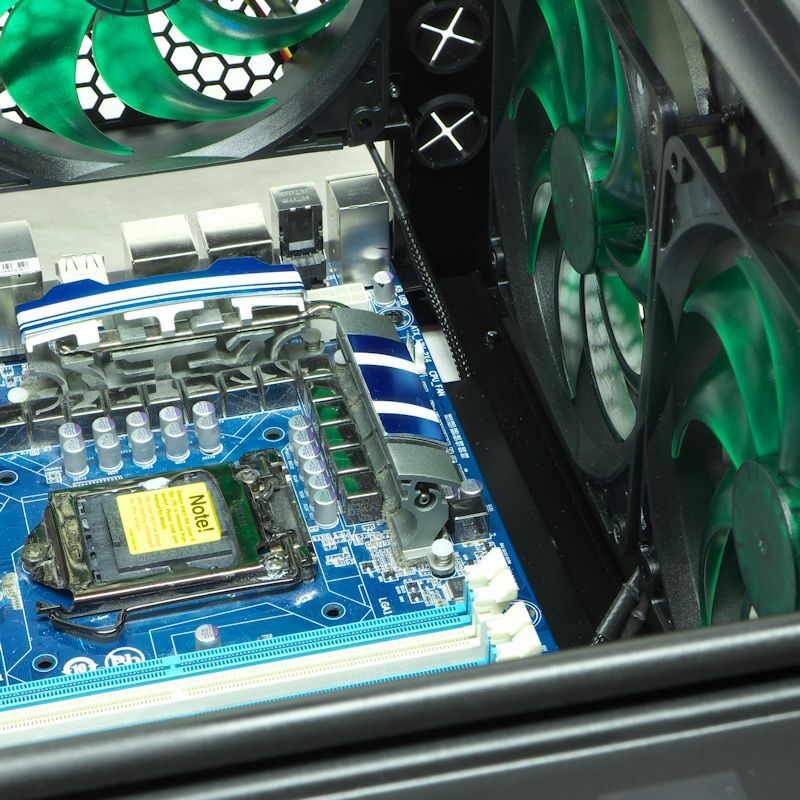 A passive heatsink and graphics card will allow us to compare the cooling powers of three very different cases while measuring the noise they make, and only the noise they make. I also set the SPL meter 10cm from the side panel with a fully fanned NH-D14 heatsink running, then removed the panel without moving the SPL meter. That allows us to compare the amount of sound attenuation the padded panel gives us. 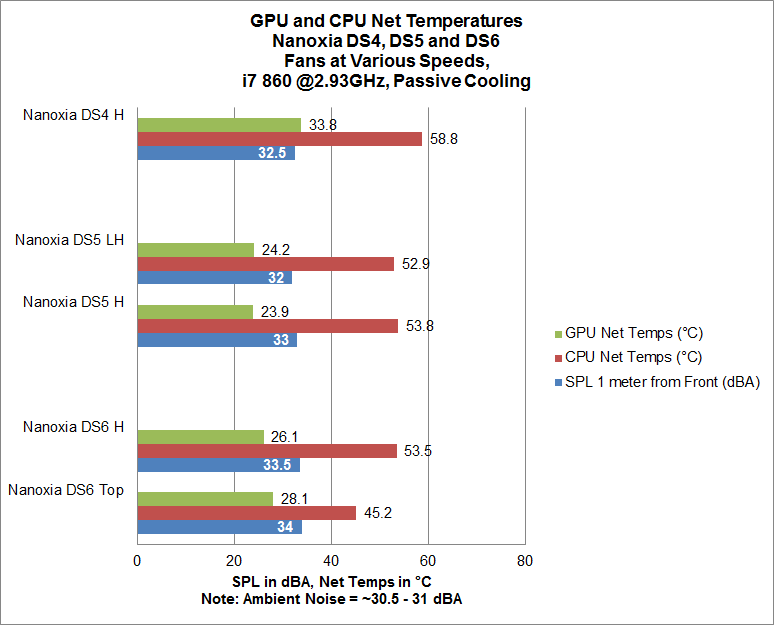 In decoding the charts below, understand that H means both the front and rear fans are running at High. LH means the front fans are running at Low and the rear fan is running at High. As you can see, whether the front fans are running or not makes no difference to the heatsink sitting in the back of the case. The exhaust fan does all the work. 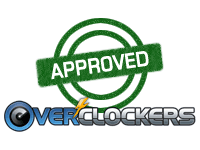 We know that because when the exhaust fan is set to Low, the heatsink runs hot enough that OCCT shut not quite 13 minutes into the run. In the next chart, it is clear that the spinning-disk hard drive’s internals dominate its temperature – it doesn’t make any difference whether the front fans are running High or Low. The SSD, however, with no internal processes to provide heat, does get cooler when the front fan is set to High. 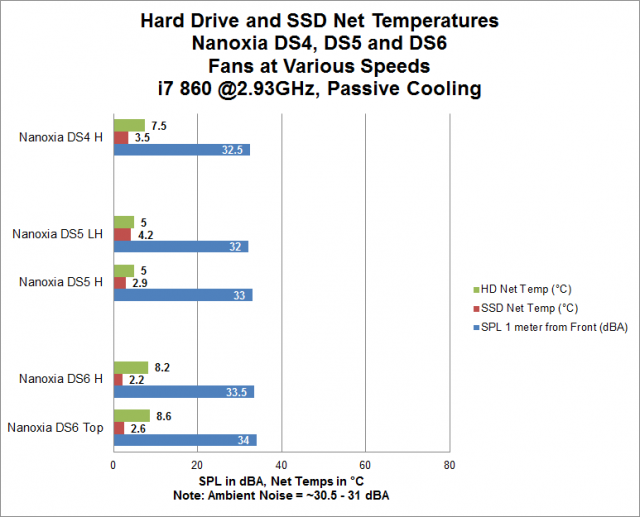 On the other hand, SSD’s never get very hot. Finally, the muffler test: With the left side panel closed, the SPL meter read 39.5 dBA at 10 cm from the side (at a distance this was very quiet). When the side panel was removed the SPL meter read 47dBA. That 7.5 dB is the difference between a quiet heatsink and a very very quiet case. 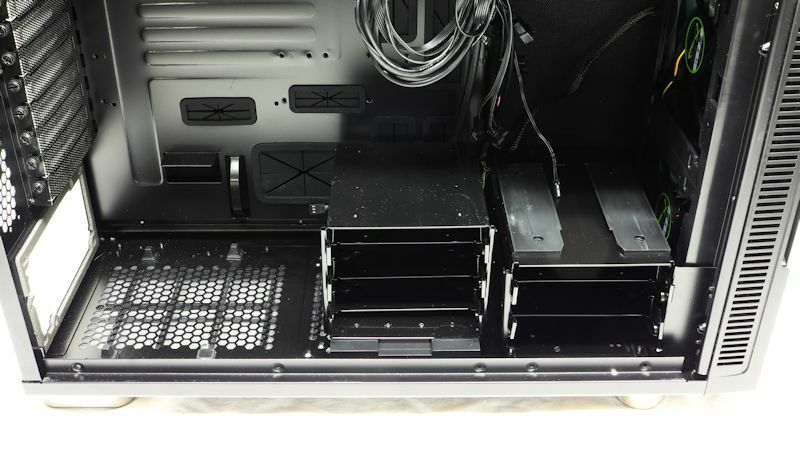 Nanoxia provides the following picture to show you how a thick double fan rad can fit in the DS5: remove the front HD cages and the rad with fans fit right in. 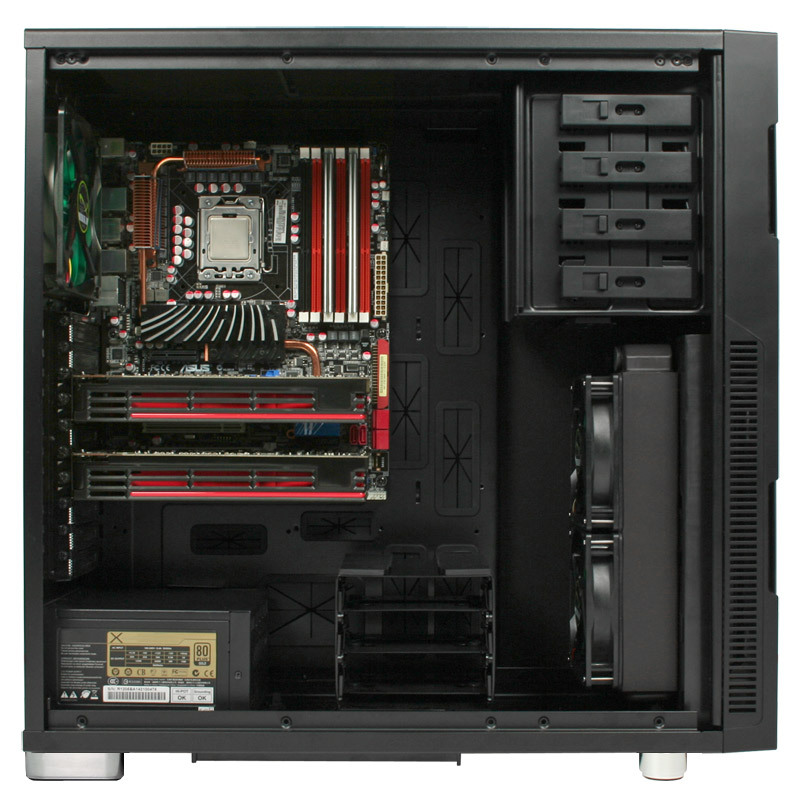 You can put your reservoir in the 5.25″ bay, so you have room for a decent sized water cooling solution. This, on the other hand, shows what happens when you try to put a 240 x 30 mm rad in the top along with two 120 x 25 mm fans. In this situation, I put the rad in first. Tightening the motherboard screws required some acrobatics on the part of the Phillips screwdriver. 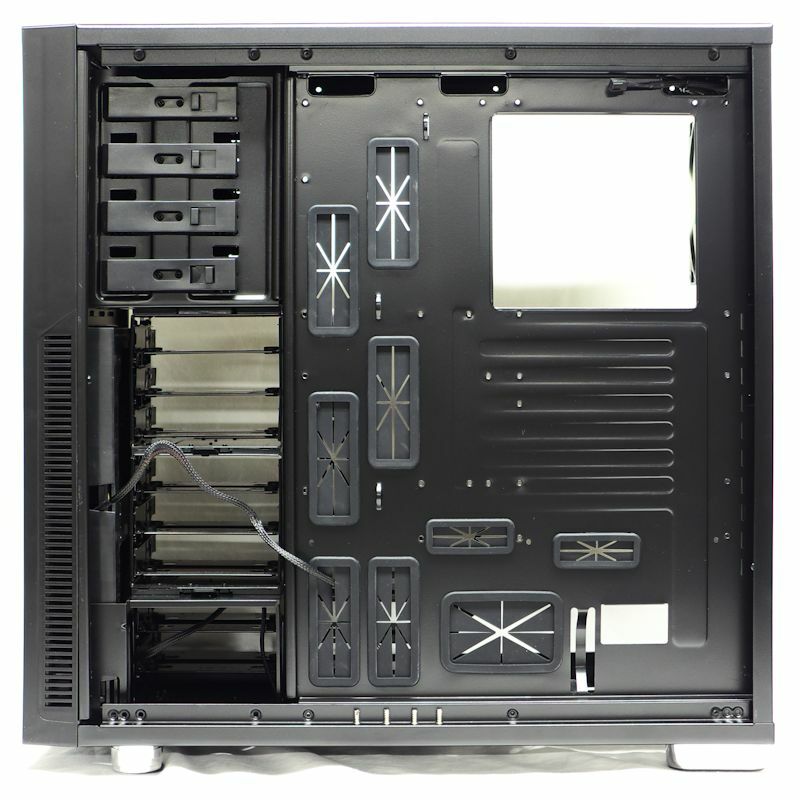 Yes, the fans overlapped the motherboard; and no, you should use no rad or AIO thicker than 25mm in the top of this case. 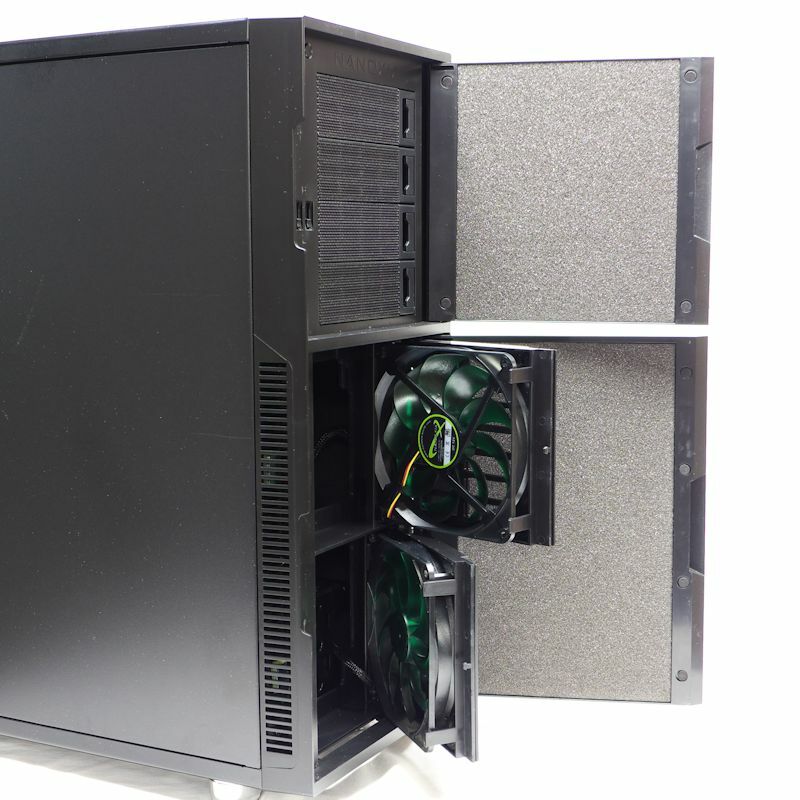 You can, however, put two 140 x 25 mm fans in the top of the case. There is plenty of room. The Nanoxia Deep Silence 5 is a full tower case that comes as close as any to providing you with true Deep Silence while letting you put all sorts of toys inside. 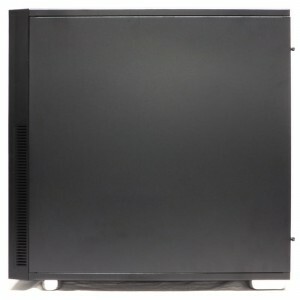 It is an air cooler’s delight, and it accommodates water cooling as well. This was an easy case to work in, and a geek’s playground, replete with lots of screws. Great fun. And Nanoxia takes acoustic padding seriously, so even the top is padded. This is one quiet case. 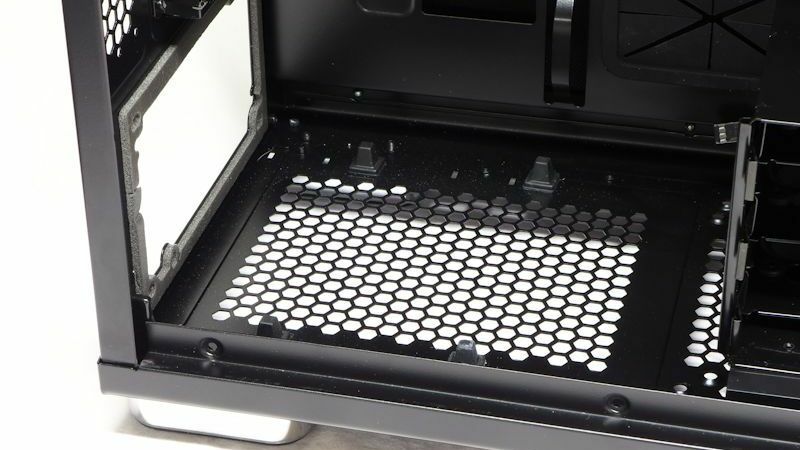 The bottom filter is a perfect mesh for filtering dust. 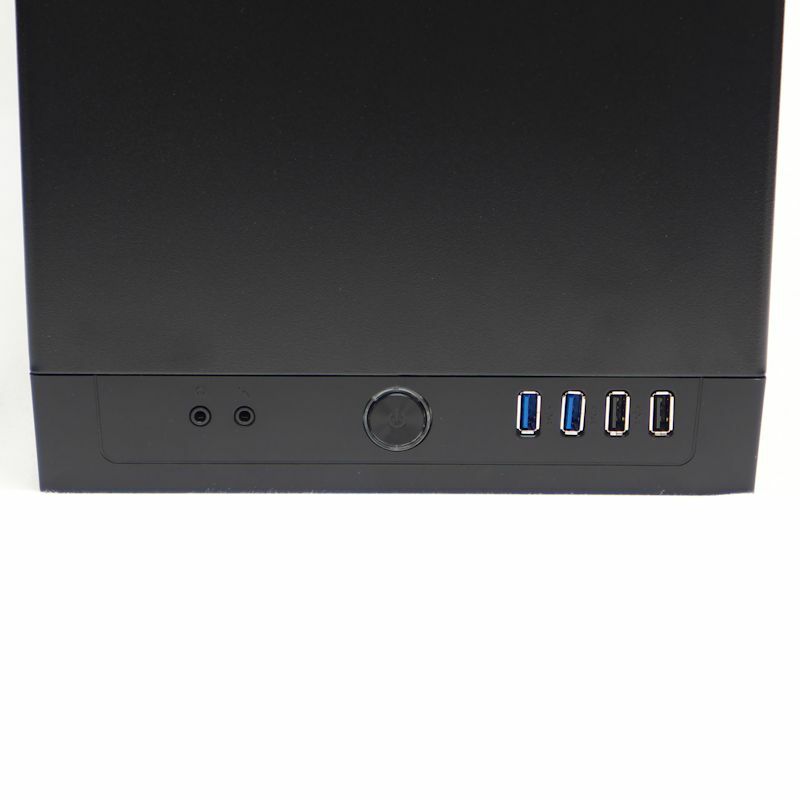 It’s too bad it pulls out the back: on a case this heavy and with your components inside, you will not want to move it to get at that filter. Other than that, there are no drawbacks to this case. The accessibility of the front fan filters alone will save you much trouble. 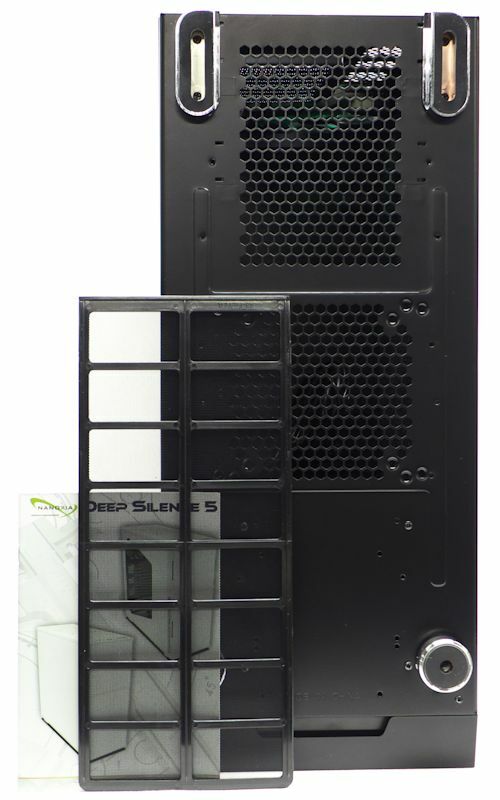 The Deep Silence 5 can be found for about $130 + shipping at Frys, and about $140 + shipping at Newegg. While this is no bargain, it is a decent price.